In late 2012, Roger landed his dream job as a solar field technician with Nextera Energy working at the Genesis solar field in California. On his way to work on May 6, 2014, his tire blew, his Prius flipped over, and he suffered an incomplete C3 injury leaving him paralyzed from his shoulders down. After three months of full paralysis, Roger has gained some motor function in his legs and arms; he lost about 40 pounds and his recovery has been slow and painful. Through ventilator weaning, recovering his voice, and just now, nearly five months after the accident, graduating to eating pureed food, he continues to focus on getting back to work someday at the job he absolutely loved. As his wife of 25 years, I am hopeful for his recovery, but I recognize that while insurance covered his acute stay at inpatient hospitals, his release to an outpatient setting will require a great deal of effort, equipment, time, and money–not to mention that I am trying to hold on to my editorial job at the same time. Even with insurance, Roger will have many uninsured injury-related expenses such as: rehab and temporary housing, along with co-pays and deductibles. Roger and I (and our two big dogs Chaco and Zuni) will be staying in Phoenix for at least the next year and cannot return home to the California desert as there are no appropriate rehab centers nearby. Roger’s biggest hope is to recover enough strength to get a job back at his old plant–any job he is able to do–while his recovery continues for months and maybe years. To help with the financial burden of Roger Overton’s uninsured medical and living expenses, a fundraising campaign in his honor has been established with HelpHOPELive, a trusted nonprofit organization that has been providing community-based fundraising guidance to patients and their families for more than 30 years. All donations are tax deductible, are held by HelpHOPELive in the Southwest Spinal Cord Injury Fund, and are administered by HelpHOPELive for injury-related expenses only. Please consider a contribution today and click the DONATE NOW button. Wow it’s hard to believe that I haven’t had time to add an update to this profile since late August. 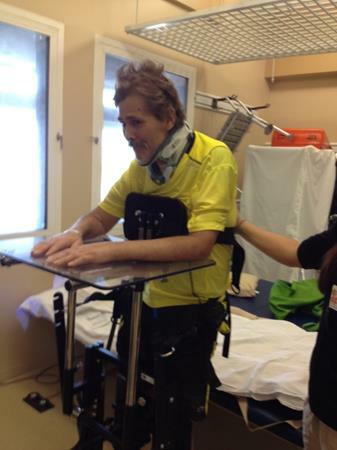 At the time this picture was taken of Roger in a standing frame, he had just started inpatient rehabilitation at Barrow Neurorehab in Phoenix, AZ. And while his eight weeks at Barrow were successful (he recovered more leg function and some upper arm and finger movements), he seriously regressed in the three week’s time he was at home after being released from Barrow — mostly because his three-hour-a-day therapy at Barrow (18 hours per week including Saturday) was cut to just 6 hours of in-home therapy per week. For all of those SCI patients out there wanting to recover, please don’t make this mistake. Roger needs at least three hours of therapy a day and needs to exercise on his own in any way he can. I’m happy to report that Roger is now eating and drinking solid foods, and is back to a two-hour-per-day therapy regimen at Healthsouth in Arizona. When he is released home again, he will be going to outpatient therapy at least 5 days a week and 2 to 3 hours per day — we will make sure of that even if we have to pay out of pocket for additional therapy above and beyond what insurance covers. Many thanks for your continued well wishes, prayers, and yes — those much-needed donations. They are keeping us afloat as we navigate rough waters! Roger sustained a C3/C4 spinal cord injury in a rollover car accident and had surgery to stabilize the spine on May 6, 2014. He is paralyzed shoulders down and unable to eat or drink, although he was successfully weaned off the ventilator. Some early signs of motor recovery at 6 weeks post injury have not returned, but his injury was “incomplete” and there is still hope for motor recovery with aggressive rehab. Gail and Roger, please let us know if we can help you in any way while here in Phoenix or as you continue your recovery. Please know that we are praying for you both and cheering you on, Roger, in your continued recovery. Keeping you both in my thoughts. Wish I could do more. Fight On Roger. Never give up.